Is it freezing in your neck of the woods? It seems like the entire U.S. had a major cold front happening last week. If that doesn’t send you running for the soup bowl, I don’t know what will. This comforting, spicy soup will warm you from the inside out. And it’ll make you darn happy too – just look at those beautiful colors! Plus, we’re putting sweet potato noodles in it – super fun to make, super delicious to eat! I’ll be honest, my kids aren’t the biggest fans of curry. And this might be the first time, I’ve posted something on the blog that they haven’t happily eaten. In fact, I didn’t even have them try this. 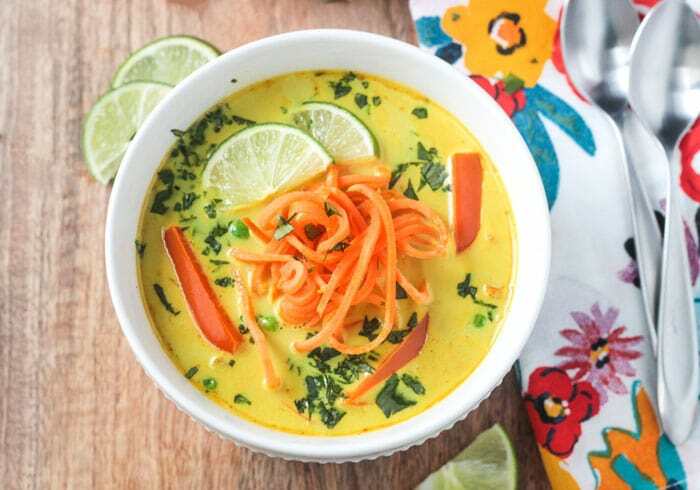 I love this Coconut Curry Soup so much, I’m keeping it all to myself – and maybe I’ll let hubby have a bowl too, if he’s lucky. 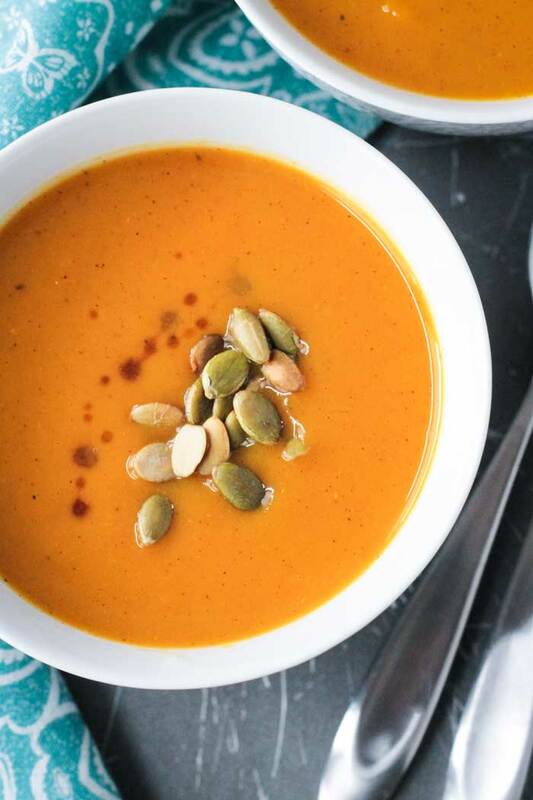 The good news is that this soup is so quick and easy – just about 30 minutes – you can easily whip it up for yourself at lunchtime while the kids are at school (which is what I did!). Or for a fast weeknight dinner for yourself when your kids are begging for PB&J’s. Or maybe your kids actually like curry and in that case, you’ve got an easy dinner for everyone! I am infatuated with my new spiralizer! I first told you about it when I made my Stir Fry Zucchini Noodles. I have so many ideas in my head about other recipes I want to make using spiralized veggies, but sweet potato noodles were first on my list! I thought they would be perfect in a curried soup – and I was right!! Sweet potatoes are considered a superfood, nutrient dense and beneficial for health. They are incredibly high in vitamin A, and C, and also boast high amounts of B vitamins, potassium, and fiber. They contain plenty of antioxidants and have anti-inflammatory properties. To spiralize your sweet potato, peel it and slice off both ends to easily adhere it to your spiralizer. If your sweet potato is rather oddly shaped or oversized, it might help to cut it in half and do one half at a time. If you end up with lots of super long “noodles”, just use your knife or clean kitchen scissors to cut them down a bit. The really long ones would be fun in a spaghetti type dish, but might be little cumbersome in soup. Roasting the sweet potato noodles for 10 minutes gives them a nice al dente texture. You’re not looking for crispy curly fries here. But I did take leftover noodles and crisp them up in the oven later for the kids…tossed them with a drizzle of olive oil and baked them about 5-10 more minutes, stirring halfway through. The kids gobbled them up and thought they were super fun to eat! 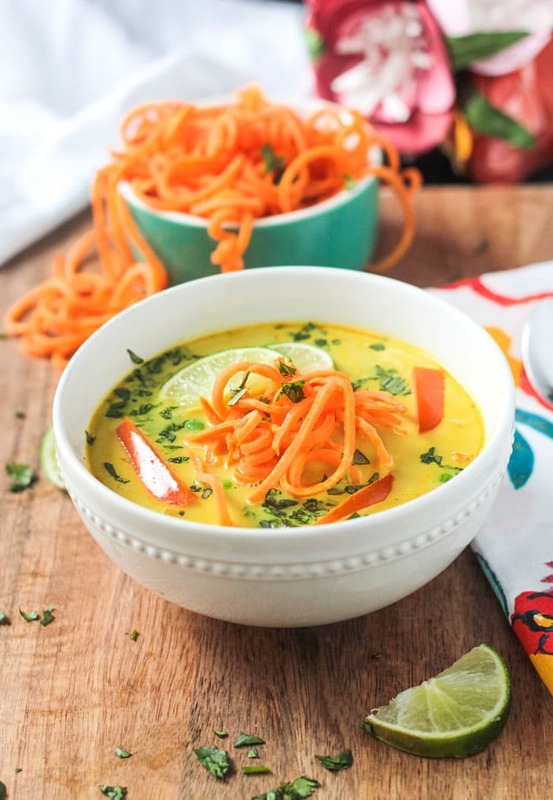 I hope you love this Coconut Curry Soup w/ Sweet Potato Noodles as much as I do! After you try it, please come back and leave me a comment below with your feedback and star rating. Please also share with your friends and family on social media. Tag @veggie_inspired and #veggieinspired so I’m sure to see it. Enjoy! Place your spiralized sweet potato noodles on a rimmed baking sheet in one layer (as best as possible). Bake for 10 minutes. Meanwhile, in a soup pot, sauté the diced onion in 3 tbsp of water until tender, about 5-6 minutes. Add the garlic, ginger, and red bell pepper and sauté 2 minutes more. Add the curry powder, vegetable broth, and coconut milk. Simmer over medium heat for 15-20 minutes. Add the green peas and lime juice and stir to combine. To serve: ladle individual portions in bowls and then top with sweet potato noodles, lime juice and a sprinkle of chopped cilantro, if desired. I use the Paderno Spiralizer Pro - 4 blade to spiralize my sweet potato. I made this soup tonight after two weeks of feasting! This was the perfect dinner to reset our eating, especially on a record-setting cold night in Illinois! I added zucchini slices and chopped spinach, too. Thank you for sharing this fantastic, and beautiful, recipe! We did not feel deprived because of its colorful and aromatic essence–it felt like we were continue the feast with a party in a bowl! Thank you! Happy new year! Thank you so much, Laura! I’m so happy to hear you loved it! I indulged a bit too much last month, too, and have been “cleansing” this week as well. And I’m in Illinois too, so I feel your pain about the cold. This weather is crazy! And I have to stand at a bus stop again tomorrow with my kids. Eeek! This recipe was so delicious! When I was shopping for ingredients, the market had fresh, local oyster mushrooms, so I added them to the soup. I also used about a tablespoon of fresh minced turmeric when I added the ginger. My whole family loved it, we will definitely make it again! Hi, Naomi! I’m so happy to hear you all loved it! Mushrooms sound like a great addition – especially locally grown fresh ones! I really appreciate you stopping by with your feedback! Have a great week! i have made this last night and its taste was actually very yummy..my whole family liked it a lot..it was delicious and healthy too..but my soup was a bit thick ..and it was becoming more thick with time..what could be the reason???? Hi, Albert. Thanks for stopping by! I’m glad you enjoyed the flavor. Was it thick after putting leftovers in the fridge or right away? If it was thick after being in the fridge, I’m thinking maybe it was the coconut milk, as it does thicken up in the fridge…although this didn’t happen to my soup…but maybe your fridge is colder than mine? Other than that, I’m not sure as it should be relatively thin. You can certainly add more vegetable broth to make it to your desired consistency. 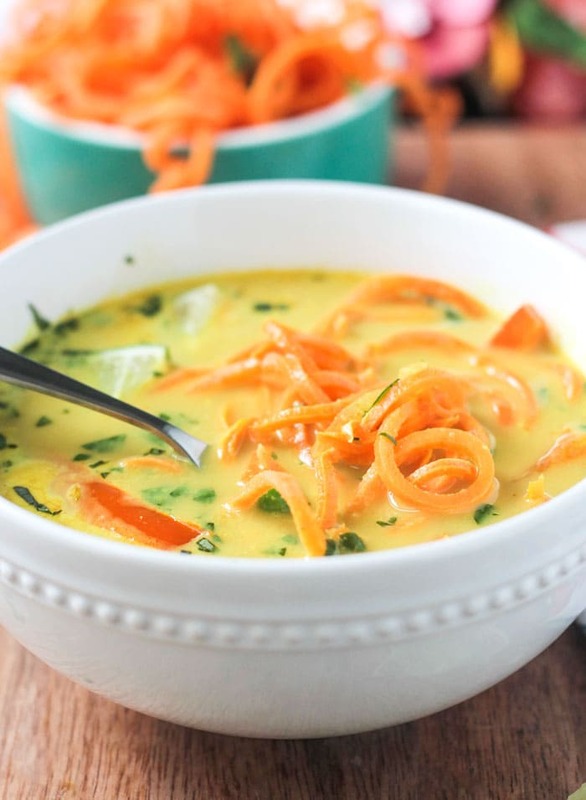 What a great idea adding sweet potato noodles to this soup. The recipe sounds delicious! Thanks, Ginny! They make slurping up this soup so fun! Ok, I swear I already commented on this but apparently I’m going crazy because I don’t see my comment! Anyways, haha, I love the soup! 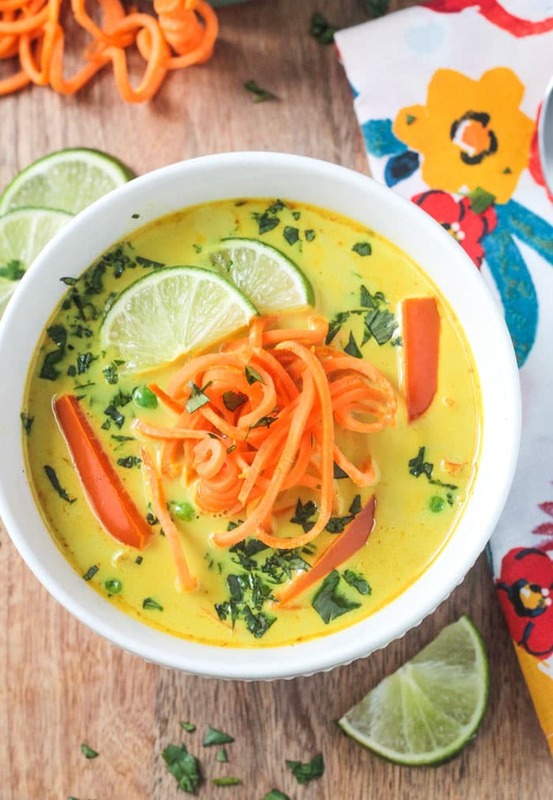 I eat curry 2-3 times a week and I love rich curry flavors and creamy soups. I love the beautiful color of your soup. I make a sweet potato curry soup as well, but it’s just chunks of sweet potato, so not nearly as pretty as your sweet potato noodles! I do that all the time! I think sometimes I comment on an FB post and then I go to comment on the actual post and think…did I already say this? HaHa! Either way, thank you!! I thought it turned out beautiful too! We do eat with our eyes first. Curry rocks! Thanks, Brandi! Lucky you that your kids don’t like curry, I’d keep it all to myself even if they did-haha! Looks delicious. I think I might too! I can’t get enough. Thanks, Linda! My kids actually are *those* kids who do like curry! I bet they would like this with the sweet potato noodles! Oh, that’s awesome! I hope you all love this!! Thanks, Sarah! Hi Jenn! This soup is dreamy! I love all the fresh color in it. Can’t wait to give it a try! Thank you, Julie! It’s definitely a beauty! And delicious too. I hope you love it! Exactly! This soup is ALL for us!! 🙂 Thanks, Melissa! Yeah, there are so many different versions of curry. I hope you love this one! Thanks, Maria! This looks so bright and refreshing!! I haven’t made sweet potato noodles yet but I can’t wait to try with this recipe! What a great soup to get your daily veggies in! I am excited to try this soup! I have been on the hunt for something new and delicious! I hope you love it! Thanks, Megan! I love this and sweet potato noodles!! My favorite way to eat them is in a pad thai, so good! I never thought to add them to soup though, great idea I need to try! Pad Thai is a great idea!! Yum! Thanks, Sarah! I saw this on Instagram last night and thought it looked delicious! Love how you used sweet potato noodles! Thank you, Mary Ellen! The “noodles” are so fun! Time for a new one! They are quite inexpensive as far as kitchen gadgets go! I’m not much of a curry fan but I LOVE the coconut milk and lime combo in soups. 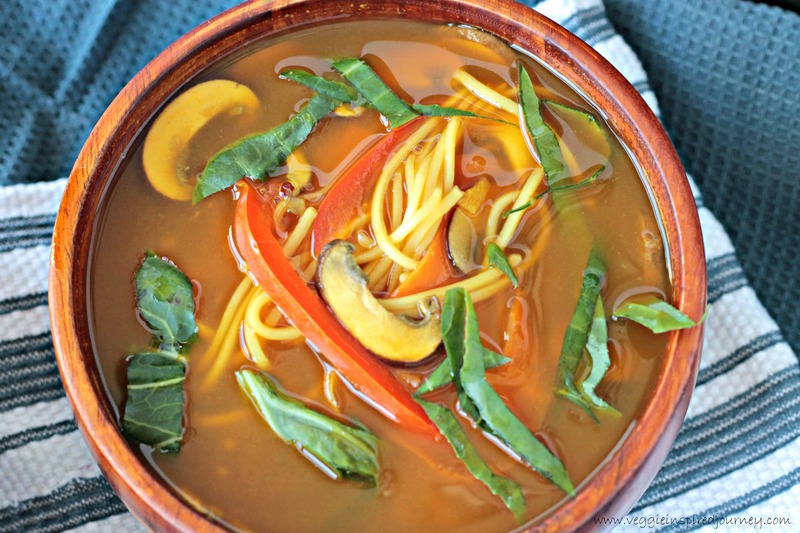 So flavorful and perfect for those cold nights! Nice job getting all those veggies in too. Mo’ veggies, mo’ better! LOL! Thanks, Sophia! Thanks, Ceara! I totally agree! This looks just divine! The sweet potato noodles are genius! I feel like the last person without a spiralizer 🙂 I love that you used the noodles almost as a garnish rather than a full dish! Thanks, Alisa! I had wanted one for so long and asked for one for my birthday last year. My mom gave me money to pick one out since she didn’t know which one to get. I finally got around to buying one in October I think. They aren’t even expensive and it’s so worth it! I think you’d love it! I love those noodles! I’ve never spiraled sweet potato before. I need to try it! You definitely do need to try it! Thanks, Dianne! Wow, talk about a gorgeous bowl of soup – the colors are so pretty! I’m ready to dig into this for dinner! So much wonderful flavor going on! Thank you, Taylor! I’ve really been enjoying it! I can’t wait to try your recipe, Jenn! I love all these ingredients, and I have a spiralizer! Spiralizers are so fun! I’m spiralizing everything these days! 🙂 Thanks, Amy! Oh my gosh – loving everything about this recipe! Curry soups are the best! Thank you! I’m kind of obsessed with it! The perfect comforting soup for this cold blustery weather. The base of the soup looks amazing on it’s own, and then you went and added those Sweet Potato Noodles…brilliant!! It IS good all on it’s own…but so much more fun with the “noodles!” Thanks, Sonali!